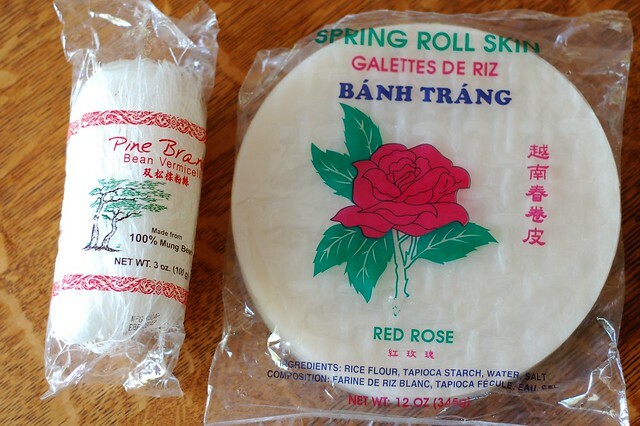 I suppose it's possible that there's something fresher and more flavorful than these spring rolls but if so, I have yet to encounter it. 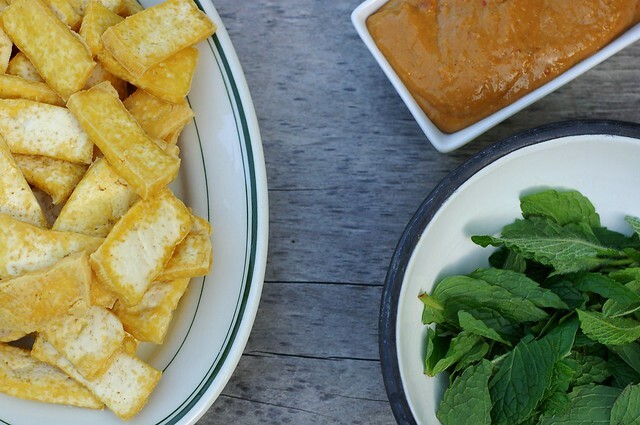 The combination of fresh basil, cilantro and mint, cool, crispy cucumbers, sweet, crunchy carrots, crispy fried tofu and a sweet, spicy peanut sauce that you get in each bite is a kind of mind-altering experience. And they are just as much fun to make as they are to eat, too - a perfect, summer dinner party food. Lay out all the ingredients on the table - thinly sliced cucumbers and carrots, crispy tofu slices, fresh basil, mint and cilantro, sliced scallions, lettuce, and rice vermicelli. And peanut sauce, lots and lots of gingery, spicy, sweet, savory peanut sauce - if space allows, I put out several bowls so people can reach it more easily. I'm also a huge fan of hoisin sauce so I always include that, too. 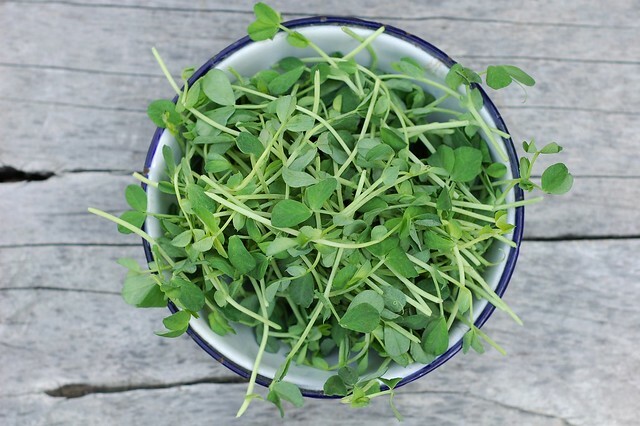 I also found the most delicious, delicate little pea shoots at the first farmer's market of the season on Wednesday so I put those out, too. Set out a big bowl of very hot water to soften the rice wrappers in and be prepared to refill it once or twice. If you're really tight on space they make these little space-saving rice wrap soaker deals. There's usually a little jockeying for position at the water bowl to get the wrappers softened but then it's off to the races we go! 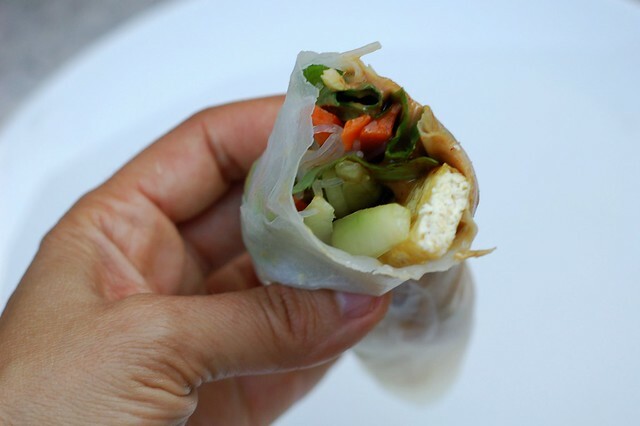 Everyone creates their own spring rolls, adding as much (or as little) of this or that as they please. You could also make a ton of these ahead of time to serve as appetizers at a summer party. These are a crowd pleaser and a perfect meal for the kind of hot, muggy weather we've been having this week. They are tasty with shrimp in place of the tofu and also very good without either one, too. Lay the softened wrapper out on your plate and plop your fillings in a neat pile at one end - as with a burrito, don't try to load too much in there at once. 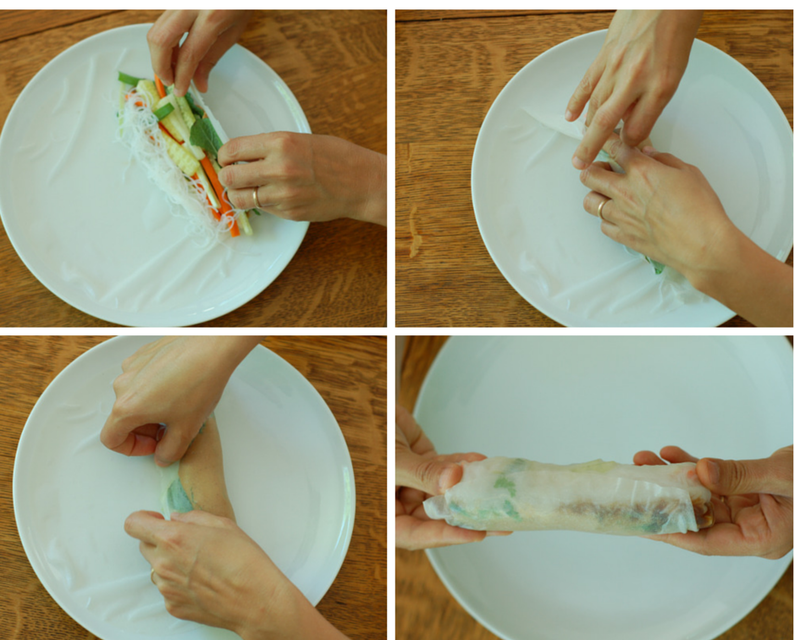 Use your fingers to tuck the fillings in as you begin to roll the thin rice paper "skin" over the top. Complete one full roll over the top and then flip the sides in to create your closed edges. Keep on rolling until you're there. Eat. Repeat. 1. 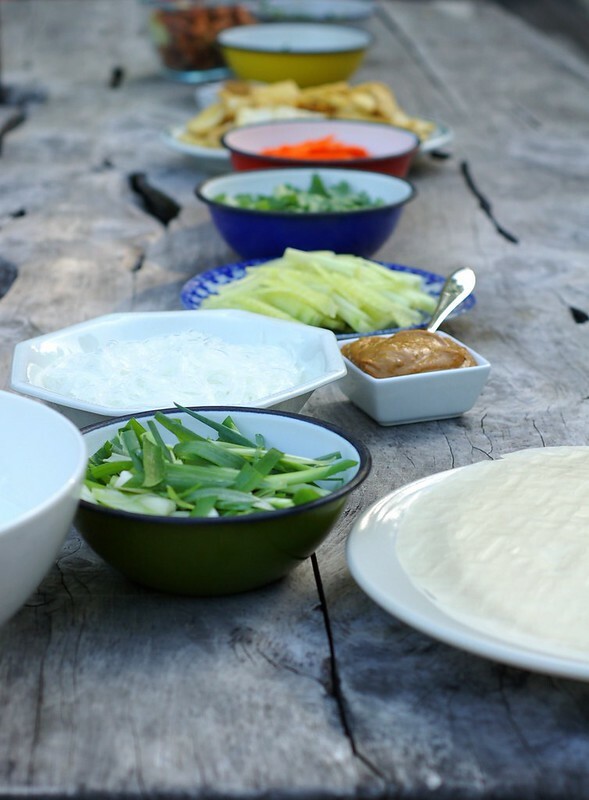 Make the peanut sauce. Do this ahead of time to give the flavors time to develop. 2. Drain the tofu by opening the package and putting the block of tofu under something solid and heavy - I usually use a cutting board with a full kettle of water balanced on top. 3. Prep all the veggies - this takes some time since there's a bunch of washing, drying, slicing and dicing but it's worth it. Put them all in the bowls or plates you will serve them in. 4. Heat the oil over medium-high heat in a large cast iron or stainless steel skillet and fry the tofu (you may have to do this in batches depending on the size of your pan), flipping once, until it's puffy and golden brown then turn them out onto a brown paper bag to drain. 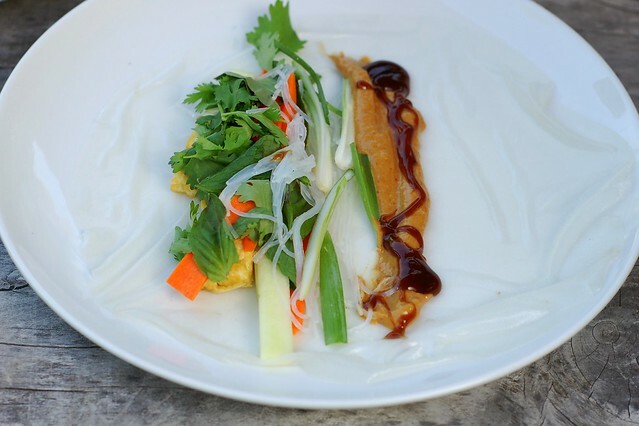 Once the tofu is cool enough to handle, transfer it to a serving plate or bowl. 5. Bring a pot of water to the boil and prepare the rice vermicelli - it's very quick - usually just a few minutes - then drain and set aside in a serving bowl. 6. Put some more water on to boil and lay all your components out on the table. 7. Pour the hot water into a bowl (or two if you can fit them on the table) and call everyone to the table to get rolling. Sticky Rice with Mango - Thank You, Thailand!